What is your most anticipated game at E3? Alright! I'm tired, so I'll get straight to the point this week. This week's question: Most anticipated game at E3? 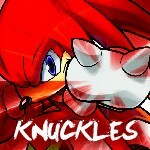 Robotnik wins the tie-breaker over Hades! Finally, I'm going to be at summer camp all next week, so I'll be sending out a PM today to a few people asking them if they want to do next Friday's poll. You keep on forgetting Sonic Lost World. But I'm anticipating SSB4 a little more at the moment. I have no idea why I keep forgetting that. Editing and posting Robotnik as the winner. Is it just me, or is there a new set up for comments? As for most anticipated game, I'll have to go with Lost World, as X and SSB are further down the line. I'm super excited for X and Y, but I'm really eager to see what Lost World will do for Wii U. True, you broke the perfect 100% streak SSB4 had going! @Capn I was playing the demo copy of DKCR3D at my local Gamestop today, when the person working there walked over and said that DKCR:TF was way more fun than it looked, runs very smoothly, and should have had a longer line at the Best Buy demos.